SYNKOPY (or SYNKOPY 61), translated as Syncopations, were born in 1960 in Brno, Moravia. The first line-up consisted of Jiri Rybar (drums, vocals), Pavel Pokorny (violin, vocals), Petr Smeja (guitar, vocals), Milos Orsag (accordion) and Petr Fischer (clarinet), a while later joined by Jiri Rybar on double bass and vocals. This early acoustic incarnation was geared towards dance halls, but in 1963 Smeja and Carvas started playing electric instruments and the sound become more rocking. Their name changed every year, ie. Synkopy 63, 64... until they finally settled on SYNKOPY 61. The band took advantage of the fact that every member was a singer, and developed into a west-coast style outfit, similar to the Beach Boys, who they would open for in 1969. In 1966 a lead vocalist Michal Polak of Shakers joined them, and with his high falsetto voice brought them even closer to the west-coast aesthetic. Also around that same time they started collaborating with a talented keyboardist, singer and composer, Oldrich Vesely, though he didn't become a full-fledged member until 1974. The late 60s were especially fruitful for the band, as in general those few years are considered to be the creative genesis and the zenith of Czechoslovak big beat. In 1968 they released their first singles on Panton, of which "Valka je vul" (War is a bull) was the most memorable, and is now considered one of the classic songs of that era. They also had success as a live act, winning many prizes at beat festivals. Come the early 70's, the era of lush harmony vocals is over and we enter an era of deep normalization. Synkopy 61 was now entering its second distinct phase, during which they looked up to Uriah Heep, of all bands, for inspiration, recording czech-language versions of some of their songs, ie. "Park" (The Park), "Bily Vrany" (Easy Livin'), and "Hrej se mnou fair" (Look at Yourself), and numerous original compositions. They released three mini albums during this time, Festival (1972), Xantipa (1973) and Formule 1 (1975), each more progressive than the last, culminating with the 13 minute epic "Touhy" (Desires). In 1975, Oldrich Vesely, the main composer, left to join MODRY EFEKT, and the band spent the late 70s in dance halls doing covers. Vesely returned in 1980 and after his experience with MODRY EFEKT he decided to turn the band (now simply Synkopy) into a bona-fide progressive rock group, and thus begins the third phase. 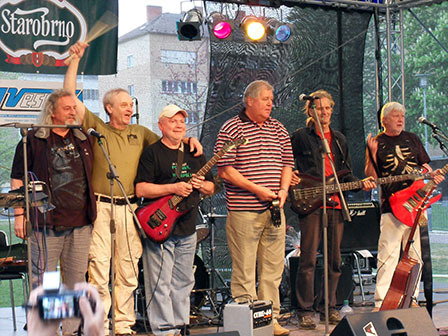 Most of the veterans (ie., Polak, Carvas, Smeji) that had carried the band since the early years had left by now and Vesely became the front-man and leader. He collaborated with renowned lyricist Pavel Vrba and another trilogy of albums was released: Slunecni hodiny (1981), Kridleni (1983), and Zrcadla (1986), each with a slightly different line-up. Of these, especially the first one is considered by many to be a classic of Czech progressive rock. The sound was synth-oriented and the style somewhat resembled classic KANSAS. The band ceased to exist in 1990, though there was a small-scale live comeback in 1992. — Magor.